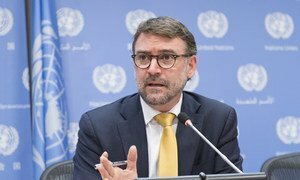 Bernard Duhaime, Chair of the Working Group on Enforced or Involuntary Disappearances, at a press conference at UN Headquarters in New York on 18 October 2018. He added that the Working Group had previously expressed its concerns over ‘short-term disappearances’, increasingly used in recent years especially in the context of anti-terrorism operations. Mr. Duhaime said it was often done “to extract evidence and finalise the investigation outside the protection of the law and often resorting to coercion, if not torture”. 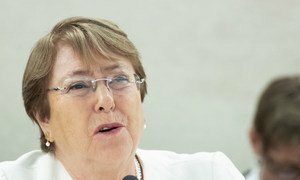 This year’s report expresses serious concern that the number of enforced disappearances continues to be unacceptably high worldwide, with 820 new cases reported between May 2017 and May this year, and called for more assistance to be made available to family members and members of civil society to enable them to report cases to the Working Group and, more importantly, to keep working on enforced disappearance issues. “Whether it is used to repress political dissent, combat organised crime, or allegedly fight terrorism, when resorting to enforced disappearance, States are actually perpetrating a crime and an offence to human dignity”, Mr. Duhaime told the Assembly, urging all Member States to ratify, without delay, the International Convention for the Protection of All Persons from Enforced Disappearance. The Working Group was set up in 1980, to help families find out what happened to their relatives. It serves as a channel of communication between family members of victims of enforced disappearance and other sources reporting cases of disappearances, and the Governments concerned.